Pebble Tiles from Islander feature smooth polished stones mounted to a flexible mesh backing for easy installation. 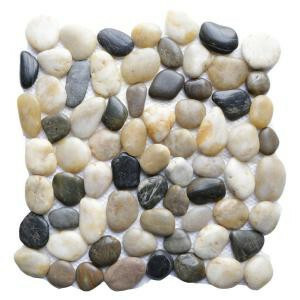 Perfect for interior or exterior projects, Pebble Tiles create a beautiful and unique decorative mosaic pattern. Add a custom touch to floors, kitchen and bath or patios and waterscapes. Installation is easy using traditional tile grout. Each tile measures 12 in. x 12 in., 10 tiles are included per carton. 10 square feet, 10 pieces per case. Case weight is 46 lb. Buy online Islander Multi 12 in. x 12 in. Natural Pebble Stone Floor and Wall Tile (10 sq. ft. / case) 20-1-MLT, leave review and share Your friends.